Observations from Gemini Observatory identify a key fingerprint of an extremely distant quasar, allowing astronomers to sample light emitted from the dawn of time. 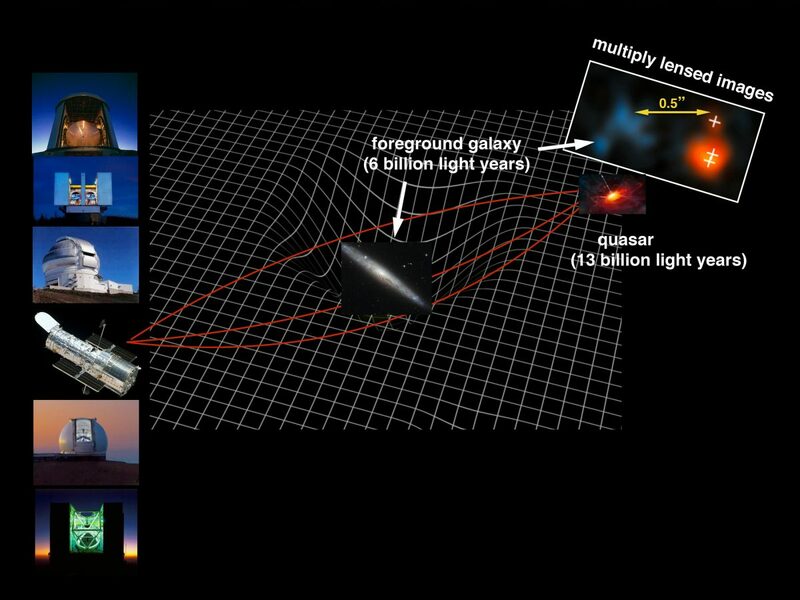 Astronomers happened upon this deep glimpse into space and time thanks to an unremarkable foreground galaxy acting as a gravitational lens, which magnified the quasar's ancient light. The Gemini observations provide critical pieces of the puzzle in confirming this object as the brightest appearing quasar so early in the history of the Universe, raising hopes that more sources like this will be found. Before the cosmos reached its billionth birthday, some of the very first cosmic light began a long journey through the expanding Universe. One particular beam of light, from an energetic source called a quasar, serendipitously passed near an intervening galaxy, whose gravity bent and magnified the quasar's light and refocused it in our direction, allowing telescopes like Gemini North to probe the quasar in great detail.